Kindergartners Abigail Greutman and Mia Ramos perform during the annual Charles E. Riley Elementary School kindergarten Stone Soup rock opera. OSWEGO – Charles E. Riley Elementary School kindergarteners recently left dozens of special guests hungry for more entertainment after their recent “Stone Soup” rock opera performance. Academic lessons on sequencing, components of stories (setting and plot), rhyming, repetition and comparing/contrasting prepared CER’s three kindergarten classes for their big performance. Teacher Jennifer Heagerty commended all kindergarten classes for their hard work, perseverance and determination to put on an amazing show. 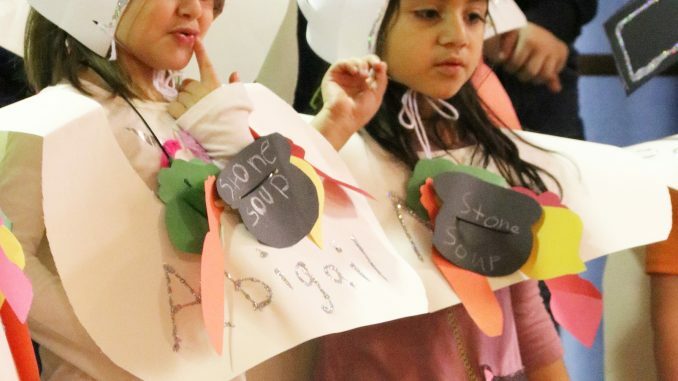 The children dressed in character with homemade costumes related to nouns and characters in “Stone Soup” as they sang and danced to cute choreography as they re-told the story to attendees. Heagerty said that also taught students the importance of oral tradition, especially with folk tales, which the kindergartners will learn more about later in the 2018-19 school year. 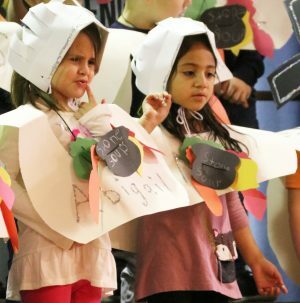 Following the performance, students proudly showed their parents and guests their own stone soup recipe cards and turkey crafts displayed throughout the school’s all-purpose room. The event also touched upon a component of CER’s implementation of the county-wide Healthy Highways initiative, which has a focus on “green light” foods, such as celery, carrots and other vegetables added to the stone soup. Each kindergartener brought in vegetables to create their own stone soup, which they enjoyed with their guests and teachers after the rock opera concluded.